The consensus is that the decade of the '60s was weak, and we're paying for that perceived pressure differential in the '90s. However, there is an exception - a land speed exception. During the '60s a number of hot rodders; Mickey Thompson, the Summers Bros, Dr. Nathan Ostich, Walt and Art Arfons and Craig Breedlove, pushed the land speed envelope from just under 400 mph (John Cobb's 394, which he set in 1947) to over 600 mph. The'70s and the early '80s were no weak speed either. Gary Gabelich, Richard Nobel and Stan Barrett moved the mark near, and some people say beyond, the speed of sound - hence the controversy. It all started back in the mid-'70s when designer/builder Bill Fredrick and owner Hal Needham began working on a two-stage, rocket-powered, tricycle-style streamliner (much like Breedlove's first and ill-fated Spirit of America) to exceed the then-standing mark of 630 mph set in 1970 by Gary Gabelich driving the Institute of Gas Technology's - Blue Flame Fredrick's assault vehicle was a 39-foot-long trike powered by a Romatec V4 hybrid that combined liquid and solid propellants to produce 24,000 pounds of thrust (48,000 horsepower), augmented by a jet-assisted take-off unit (JATO) in the form of a 12,900hp Sidewinder missile. 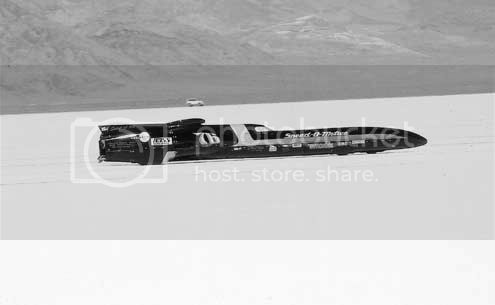 During 1976 both Needham and Kitty O'Neil tested the Budweiser/SMI Motivator - sponsored vehicle in excess of 600 mph on a huge dry lake located in Oregon. Three years later fellow Hollywood stuntman Stan Barrett lit the fuse at Rogers dry lake (aka Muroc/ Edwards Air Force Base) and literally rocketed off the starting line. Some 12 seconds into the run, Barrett punched-in the Sidewinder at 612 mph, which pushed him to a terminal speed of 739.666 mph (or Mach 1.0106), duly recorded by Edwards' state-of-the-art tracking radar and the team's own on-board computer-telemetry equipment. However, the rub is this: FIA rules state that any land speed attempt must be made under its or an appointed agent's jurisdiction. Furthermore, the attempt must be "two-wayed" within an hour over the same piece of real estate. None of these conditions were met. So the purists, including Craig Breedlove, feel the Fredrick/Needham/Barrett mark is, at best, unofficial. Needham doesn't let these "details" bother him. "We were interested in breaking the sound barrier, not setting an FIA record," Needham says. "We did it, and we can prove we did it no matter what Breedlove or those other guys say. [The Motivator] is in the Smithsonian now, and [that museum] doesn't display bogus cars." Meanwhile, Craig Breedlove "the first person to officially top the 400-, 500- and 600-mph mark" is trying to be the first to officially go faster than the speed of sound (730 mph at sea level) on five wheels. We say "five wheels" because Speedlove's latest "Spirit of America" rolls on five wheels and resembles a four-ton arrow, or a modern jet fighter sans wings. Unlike Needham's rocketeered trike, Breedlove's 47-foot-long land speed racer is urged by a highly modified J79 GE-8D-11B-17 jet engine capable of producing about as much power as Needham's needle. "The problem is accelerating all that weight," states Needham. "My car tipped the scales at around 3700 pounds, including fuel and driver. Moreover, it was rocket powered. It had over 60,000 horsepower "I mean instant acceleration, with no turbines or afterburners to spool up." Breedlove doesn't appear worried about the seeming discrepancy in the power-to-weight ratios. He plans to do the deed on a huge dry lake located in the Black Rock Desert (100-plus miles north of Reno, Nevada) or the Bonneville Salt Flats. Black Rock offers enough room (approximately 13 miles) to allow the 9000-pound lawn dart to reach its maximum speed and slow to a stop. Needham's 1979 effort brings only scorn. "It was unofficial, uncalibrated and unsanctioned," says Breedlove. "The rocket car represents an achievement in design and driving skill, but it was a nonevent "a travesty to people who work toward the goal of setting goals. It is not considered by me or the teams in England to be anything but unofficial and inconclusive." Yes, fellow hot rodders, the Brits still have the lust for speed. Englishman Richard Noble, the current land speed record holder (634 mph) is putting the finishing touches on his Thrust Super Sonic Car, an 11-ton monster "thrusted" by a pair of Rolls-Royce jet engines that once powered an F-4 Phantom. Noble is scheduled to share the Black Rock lake bed with Breedlove. And another land speed car "being built by McLaren Advanced Vehicles" is on hold due to a "lack o' moola," the age-old problem that has always plagued land speed racing. As costly as it is to build and race land speed cars, there seems to be no lack of interest in this esoteric endeavor. Along with Breedlove and Nobel are in-progress attempts by Gary Swenson (American Eagle One, Puyallup, Washington), Rosco McGlashan (Aussie Invader 2, Perth, Australia) and Art Arfons (Green Monster, Akron, Ohio). There are also Wheel-and-Piston-driven attempts to exceed Al Teague's and the Summers Bros' 409-plus-mph marks. Aussie Glen Davis is putting together a twin-engine (turbocharged V12 tank powerplants) 'liner called the Australian Challenge to go after the Summers' multi-engine record. The husband and wife team of Roger Lessman and Lyn St. James are aiming at Al's single-engine mark with a twin-turbocharged, natural gas, 572-inch big-block "Fordified" streamliner. After it's all said and done, money, time, weather, surface conditions and luck will ultimately end the great land speed controversy, and everyone can agree on that. In the '60s the FIA split the land speed record attempts into two categories: Unlimited and Wheel-and-Piston driven. Here, Breedlove is on his way to a new Unlimited record of 408 mph, which he set on August 5, 1963. 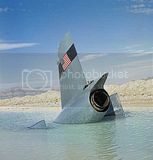 Breedlove's first record return run ended up in a brine pond at the west end of the Bonneville Salt Flats after he experienced a drag chute failure. Folklorists claim he stated after climbing out of the near-totally submerged car, â€œFor my next act I'm going to set myself on fire. Approximately 14 months later, Tom Green drove Walt Arfons' Wingfoot Express to a record-breaking 415 mph. A Westinghouse J46 jet rated at 10,000 horsepower helped do the deed. The Wingfoot Express II was rocket powered and ran 580 mph. Art Arfons was also on the land speed record hunt and designed, built and drove a series of “Green Monsters.” Three days after Tom Green broke the record, Arfons upped the ante to 434 mph. Eight days later Breedlove took it away with a 468-mph average. The efforts of Breedlove and Art Arfons continued to push the Unlimited speed record. In October 1965 Breedlove ran 526 mph, only to see that record surpassed a few days later when Arfons' 544 put him on top. Seven days passed before Breedlove again regained the mark with a 555-mph average. In even less time Arfons came jetting back, pounding the salt at 572, only to see Breedlove do him in shortly thereafter while breaking the 600-mph mark with a two-way 600.842. 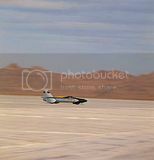 In October 1970 Gary Gabelich “Blue Flamed” into the record book with a 630-mph average, which stood as the official FIA land speed record until 1983, when Richard Noble upped the mark by 4 mph to 634.052. On two wheels and a prayer Stan Barrett cracks the sound barrier at Edwards Air Force Base. This is definitely an ”E ticket“ ride. James Ibusuki's cutaway rendering allows the reader to better visualize how Craig Breedlove's latest Spirit of America is packaged. This Spirit features a 330-inch wheelbase. During a recent press conference, Breedlove said preliminary testing of his new land speed car will begin in June at Muroc. The vehicle's construction is essentially steel tubing covered by stressed Alcoa aluminum skin, in addition to the driver's capsule, the air ducts and the rear wheel fairings, which are made from Hercules carbon/Kevlar/ glass-fiber composite. The wheels and tires are Center Line/Alcoa heat-treated spun discs that support filament-wound, carbon/glass-fiber composite material with a rubberized epoxy matrix. Meanwhile, Wheel-and-Piston-driven cars are being prepared to break both the Summers Bros' and Al Teague's 409-mph marks. Bob and Bill Summers are shown in 1965 with their four-engine Golden Rod, which still holds the unblown record of 409.695 mph. Al Teague's 409-plus-mph record remains the high-water mark for blown engines.